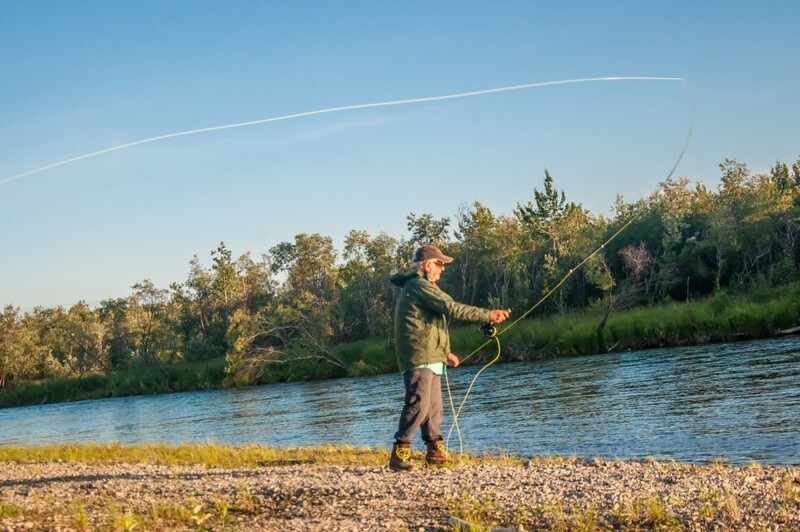 America’s Veterans fly fishing, rafting, and camping in the midnight sun along Alaska’s Kanektok River. From the trip log of June 27’Th, 2016. 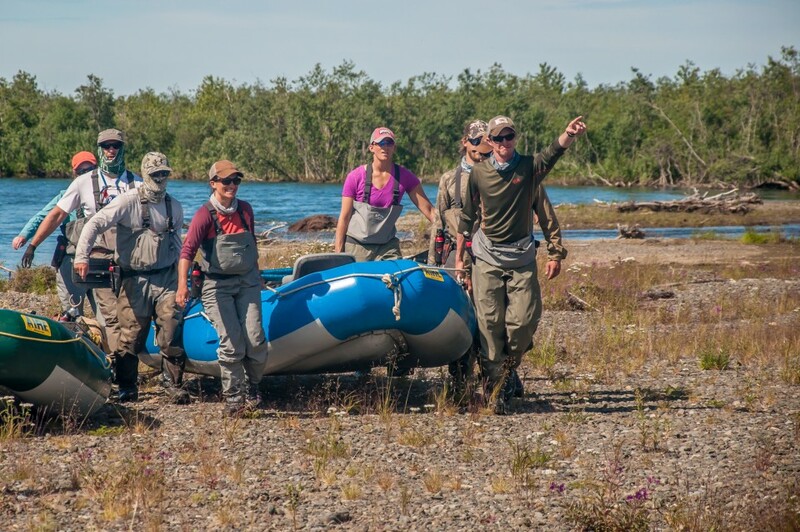 We would travel much lighter than standard guided trips so that we could raft skinny water farther from the established river channels and try to pioneer some new camps. We wanted to climb some unnamed peaks and bluffs along the way. To do this we ditched traditional tents in favor of Black Diamond Megamids and Bivy sacks under a group tarp shelter to save weight. We’d drastically reduce the amount of food we’d carry and depend more on the fish we caught. 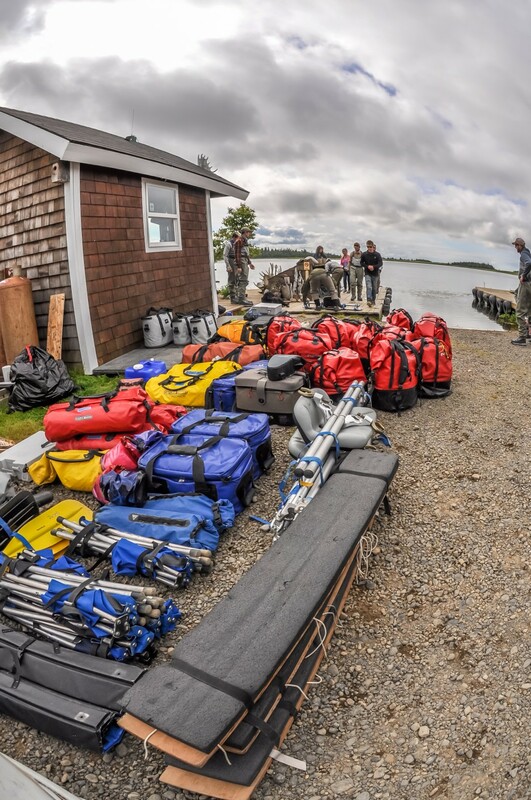 We all cut back on our personal gear so that floatplanes and rafts would be as light as possible. 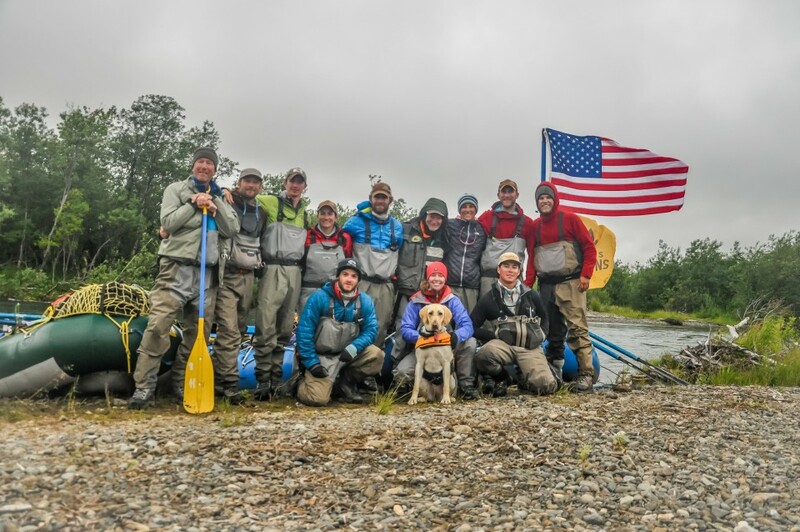 This was the fourth annual Veterans Expeditions Alaska Fly Fishing Trip. 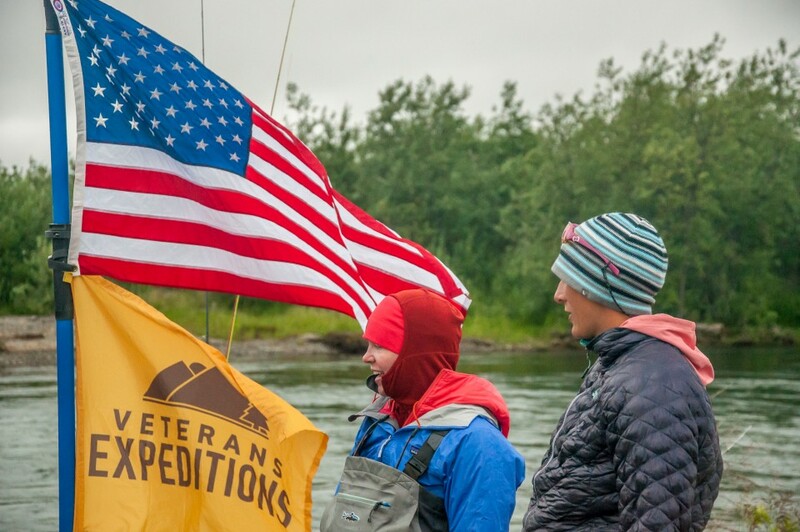 The annual Alaska trip was conceived by Nick Watson co-founder and Director of Veterans Expeditions. 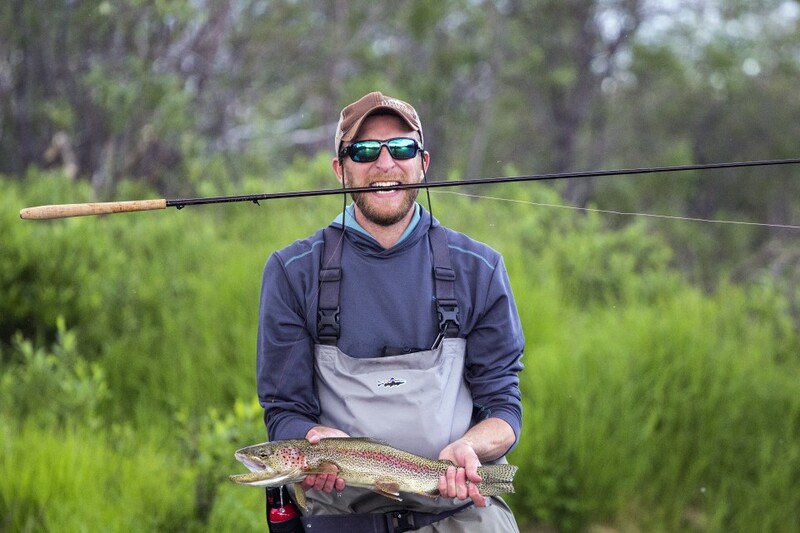 Nick’s philosophy is to involve military veterans in Alaskan expeditionary travel, and fly-fishing in a more profound and direct way than being passive recipients of a “fully guided fly fishing trip”. 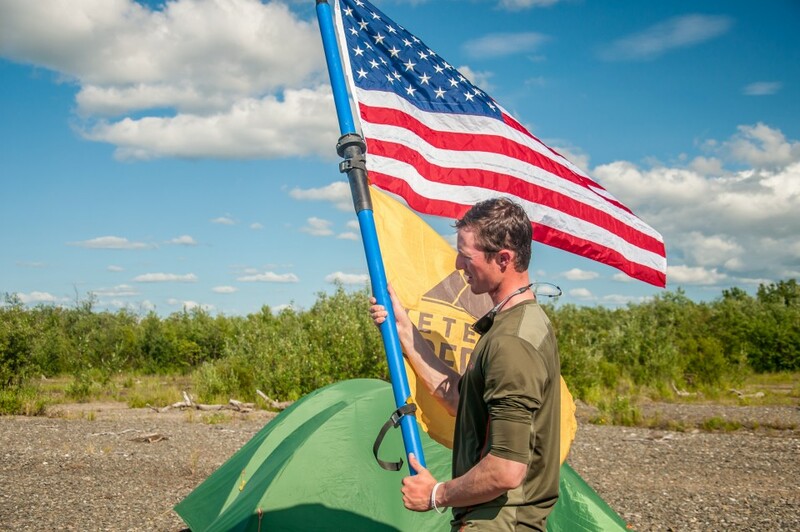 Nick believes veterans want to experience authentic and visceral, even edgy expeditionary travel rather than something “canned” with passive participation. 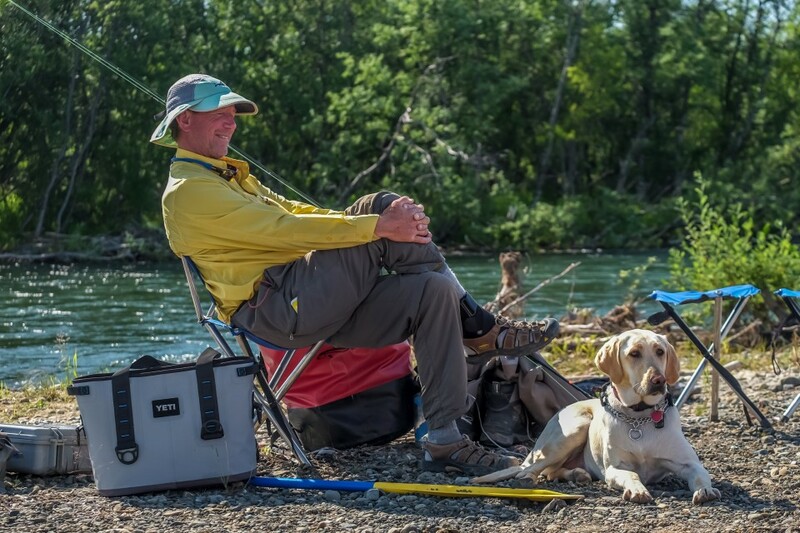 To that end everyone would share the paddling, the camp setup, and the “learning curve” of fly rod use on a completely wild river. Veteran’s Expedition’s concept as applied to expeditionary fly fishing is to travel light without excess gear, to fish lesser known waters off the beaten track- to use scouts to reconnoiter where potentially hazardous conditions might put participants at risk – to explore vantage points on peaks and bluffs along the river, to rely on each other as a team to solve problems, and with a little luck catch some great fish on the fly! The 2016 team of Veterans had served in Viet Nam, Afghanistan, Iraq, Africa, the Middle East and worldwide in various capacities from the Army, Air Force, Navy and Marines as Rangers, Special Forces, Flight Nurse, Logistics, Intelligence and more. 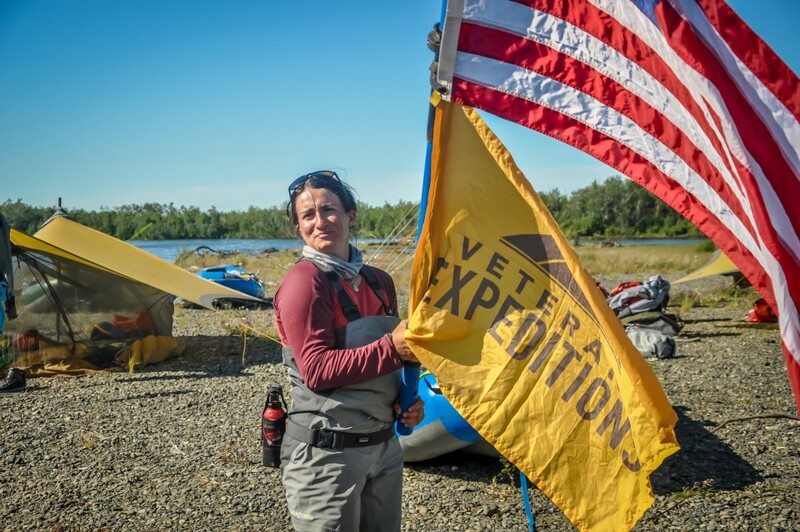 In 2016 the Veterans Expeditions Alaska Fly-fishing team included 3 female veterans, for the first time. We got to hear stories about their deployments that for our guide staff was the first we’d heard from the female veteran perspective. 0600 hrs on fly out day: We “coffee’d up” in good humor, got our aviation weather forecast, packed, breakfasted, trucked over to the floatplane lake to weigh all the gear, and loaded it into aircraft. Then we did what men and women in service do all over the world: We “hurried up- and waited”! We waited on fog to lift and mountain passes to open up for VFR flight. Then mid day we loaded service dog Dixie for her first small airplane flight and flew outbound through lush green mountain passes in a Dehavailand Beaver and Cessna 206. By late afternoon the rafts were assembled and we were ready to shove off downriver. Let the adventure begin! Our 4 Rafts pushed downriver propelled by strong paddlers and we made record time. 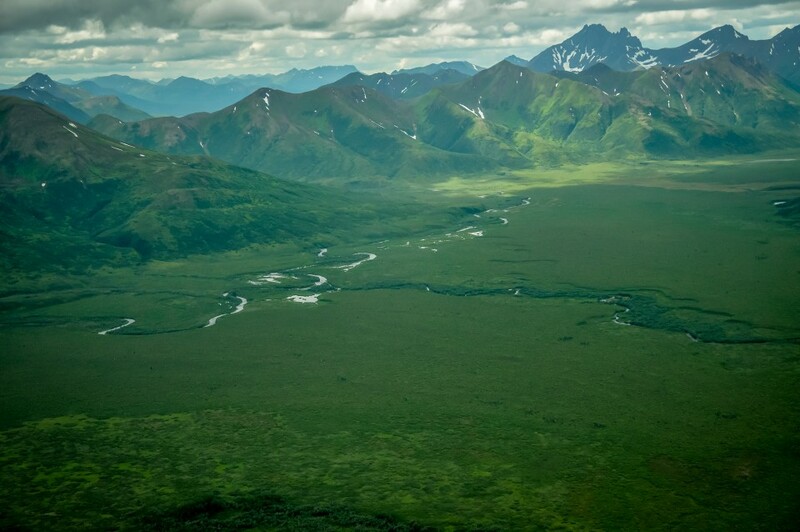 We heard the shrill cries of Arctic Ground squirrels from the surrounding tundra as we passed their colonies. We chose a camp a dozen miles below the lake where we were greeted by Arctic Terns overhead and the 3 note calls of Yellow Crowned Sparrows singing on riverside territories. 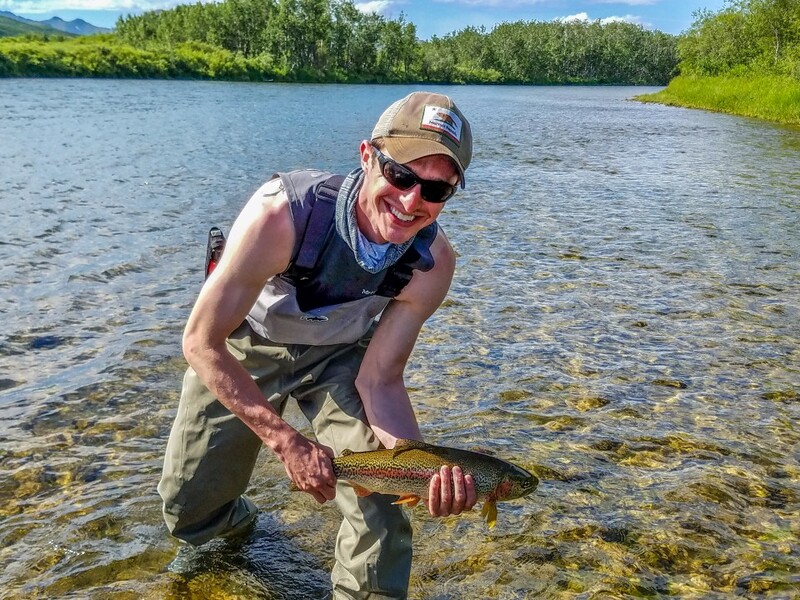 Brendan took a fine, highly pigmented, Leopard spotted Rainbow Trout on his Tenkara rod from camp! The female Vets set up their group shelter a.k.a. 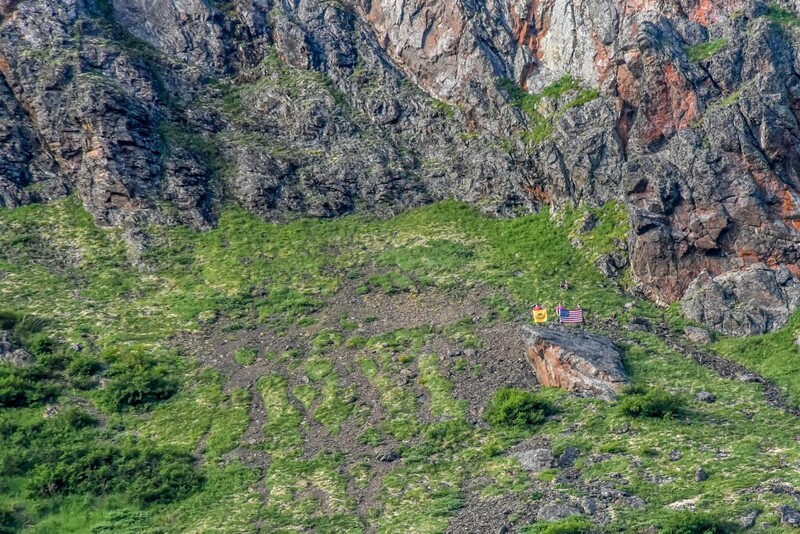 “ The Wing”, and the guides set up another “Wing” for their use while the rest of the canine and human participants settled into a routine of deploying the Black Diamond Megamids, a tent for Mark and creating comfort in a wild landscape. As we did this the Alaskan biting insects made a strong showing and most of us donned head-nets or “buffs” and or Deet to deal with them. We finished the night with big pasta feed and turned in about 10:30 pm content to be in the wilderness with a strong group. 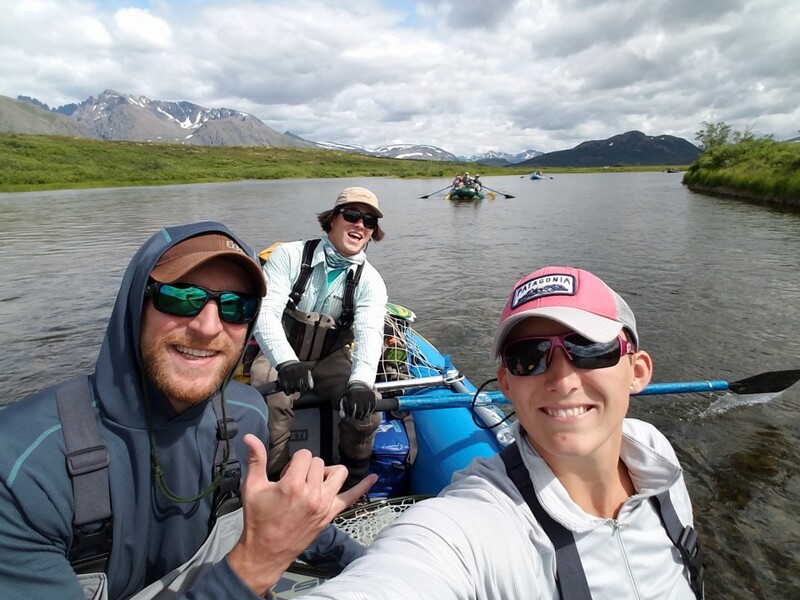 We paddled & rowed & fly-fished 14 miles on day 2 and pioneered a new camp beneath an unnamed peak. 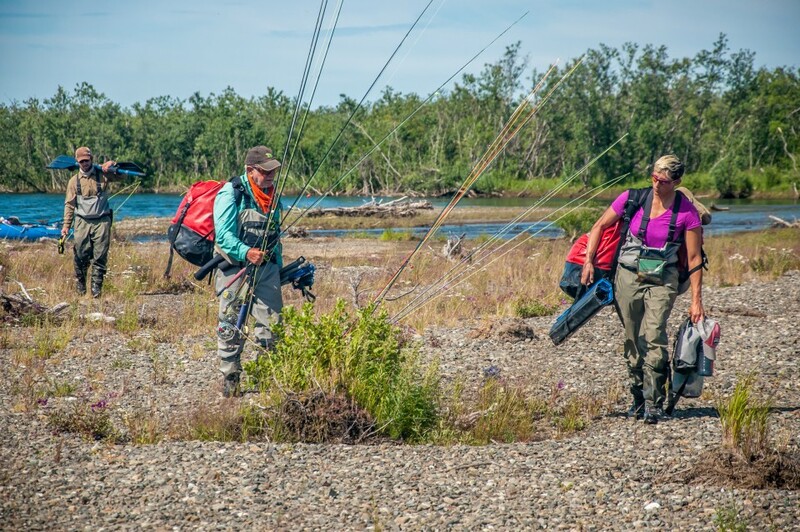 It’s always a joy to pioneer new camps, routes, and fisheries with the Vets. 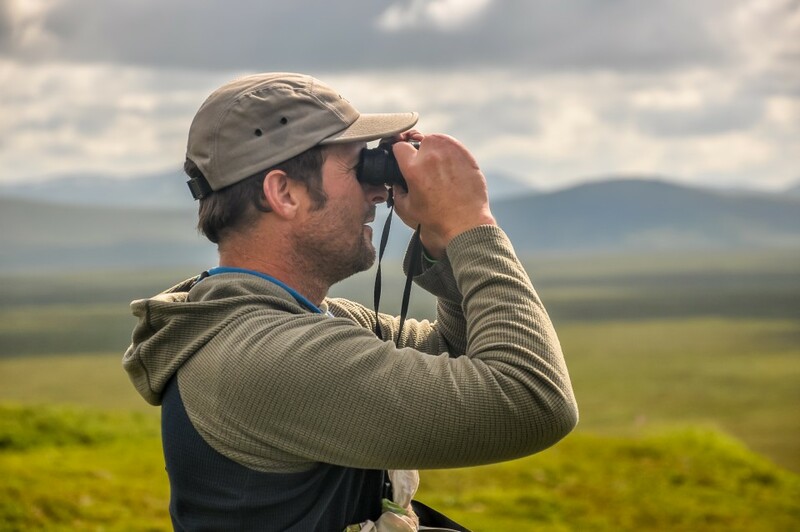 They are “game” to work harder, go farther, and see what’s around the next bend or what’s over the next ridge in ways that we can’t do on a retail guided trip. The gravel bar that they chose that afternoon was partly vegetated with “River Beauty”, “Yarrow” and “Cinquefoil” all in full bloom. A summit attempt was made that second evening on the peak they named “Pete’s Peak”. The summit team of Kari, Katelyn, Andrew, and Pete made a great approach only to be turned back by unsafe / rotten rock conditions below the summit. Still a vantage was achieved. On the descent a bull Caribou passed within yards of the climbers. Those who remained in camp watched it all unfold around the campfire that Steve built. 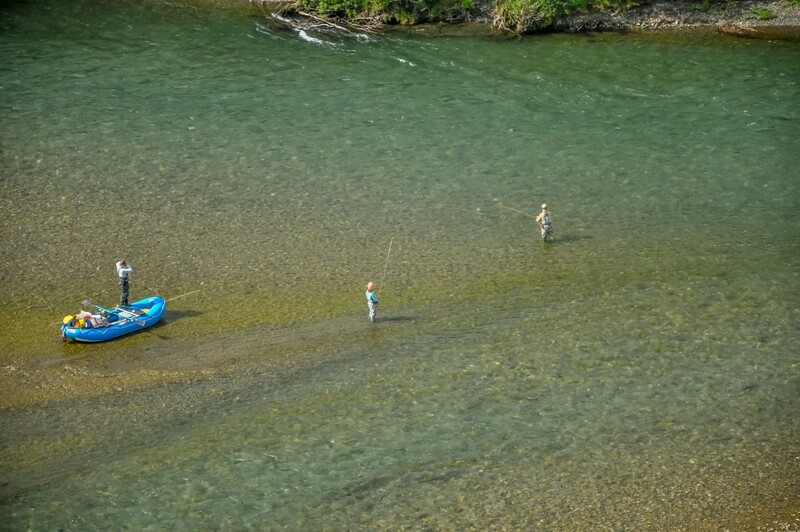 On June 30’Th we fished our way down many side channels which hadn’t seen an angler in 8 months. 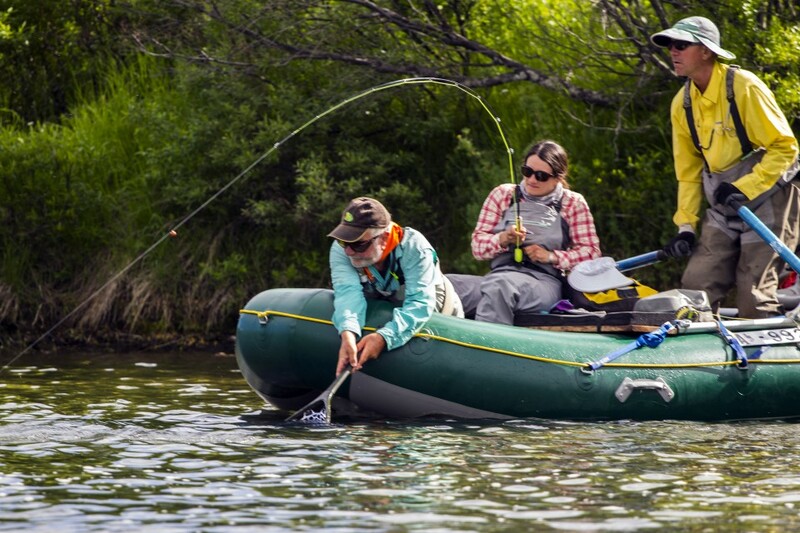 We rafted and waded down “jungle tour” channels hunting Rainbow trout and Arctic Grayling with considerable success. In the afternoon we pushed on through intense downpours. The kind of downpour where the rain drops seem to leap upward back out of the water. We’d entered “the braids” of the Kanektok where the river channels carved by prior floods create dozens of islands each with it’s own back channel. 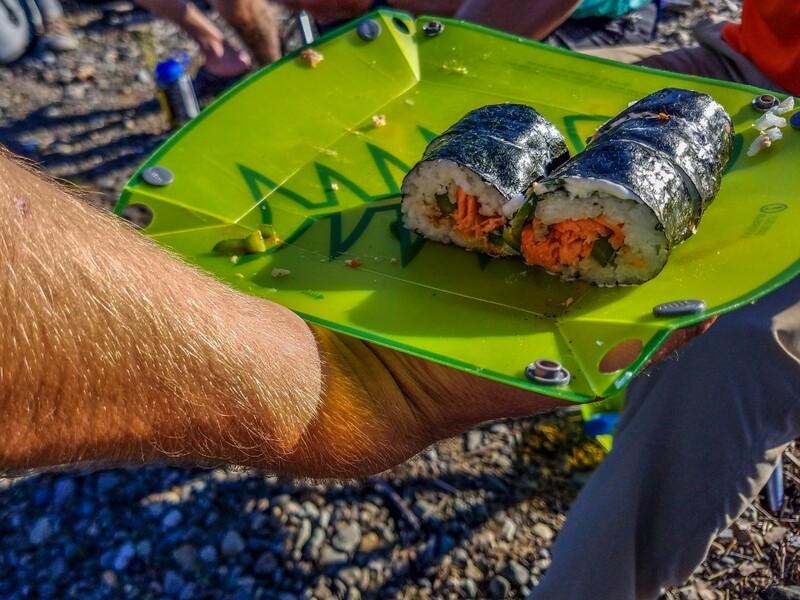 Our scout boat found the vanguard of the 2016 salmon run that afternoon. Small pods of Sockeye, and Pink, and King salmon rested in a quiet pools. “ The water was ‘severe clear’ almost colorless. 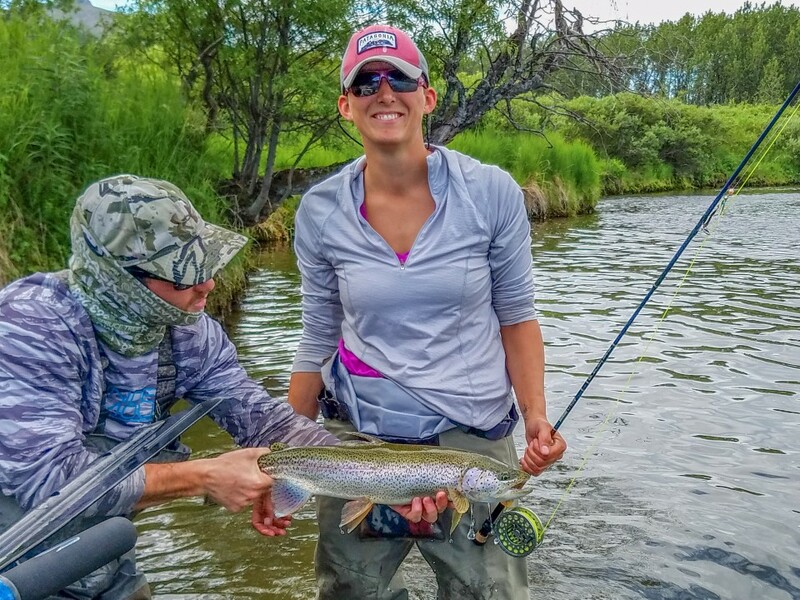 Katelyn took her first trophy Rainbow in what the log describes as a ‘full rodeo’. Steve had fished the mouse hard much of the day, but the Rainbows were ‘not having it’.” The fish wanted streamers. The log was full of entries of the anglers finding success while refining their fly-fishing technique. We camped on a side channel below a dramatic rock outcropping. Some of the Vet anglers were brand new to the sport, a few had intermediate skills, and Steve Marks had skills honed over a lifetime. One of the joys of a wilderness fishing trip like this is that whatever your skill set you will find your own angling challenges. Over the course of a week this group fished 100 miles of wild river and hourly became more proficient at reading the water and delivering casts to their quarry. As we paddled downriver you couldn’t help but be aware of the nesting migratory birds. The male Arctic Terns scooped up salmon smolt and delivered them to their mates at nests on gravel bars. The large sandpiper was the Greater Yellowlegs, which shrieked as we passed by. Bald Eagles watched as we rafted. 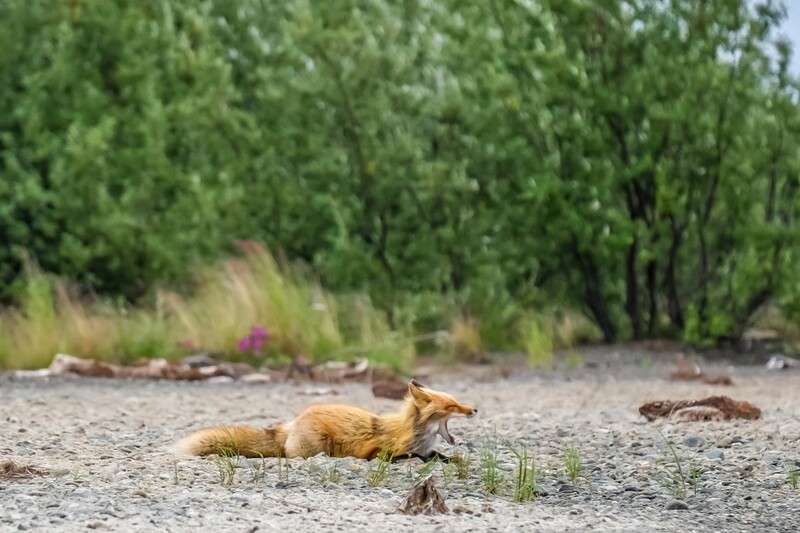 The birds and the smaller animals like Red Fox, Mink and Beaver were the bulk of wildlife seen on the river, while the “mega-fauna” like Caribou, were the memorable punctuation marks to the trip. 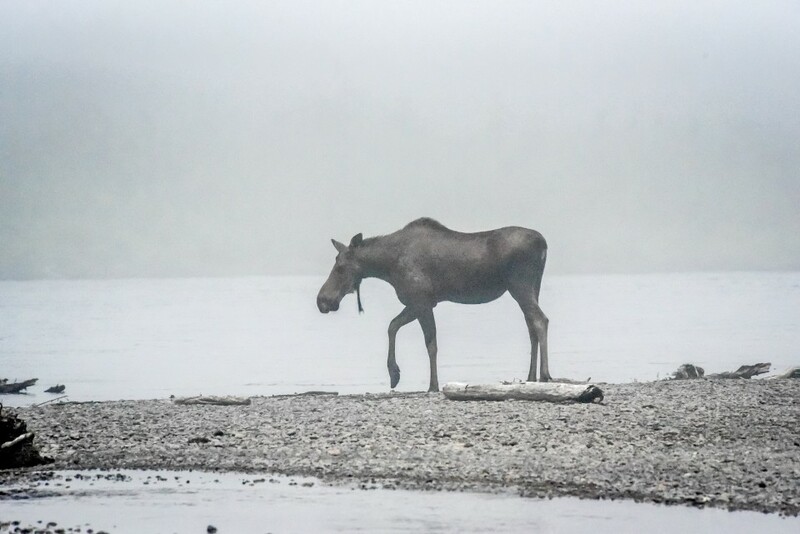 In camp one morning we watched a cow moose swim across the river all shrouded in mist. The log records “By day’s end we’ve come 6o miles from our mountain lake and those mountains are receding in the distance. The only tracks on the bars are moose. 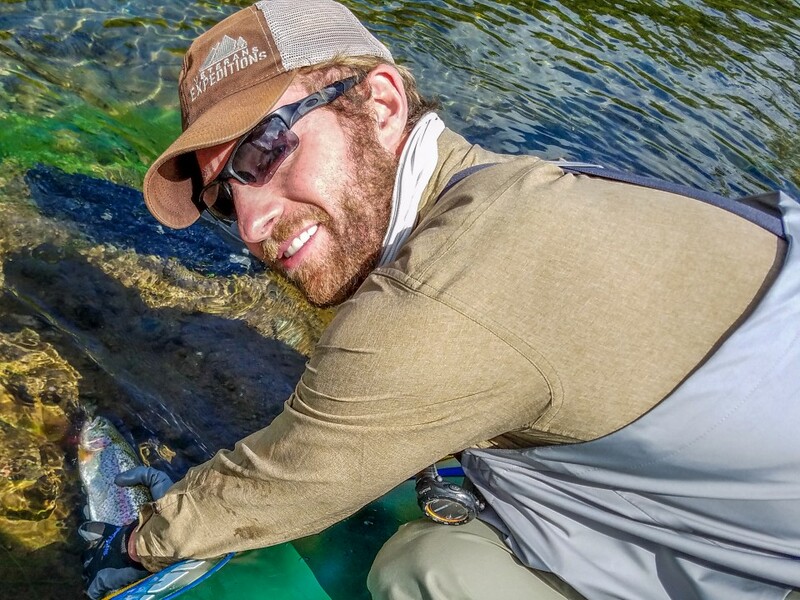 The Brown Bears are not yet on the river.” This marked the day the fishery changed from a headwater fishery of resident species to one largely composed of migratory fish. We saw over 500 Sea Run Dolly Varden this day along with, 50 Chum Salmon, 25 Sockeye, 20 Kings, and a handful of Pinks. 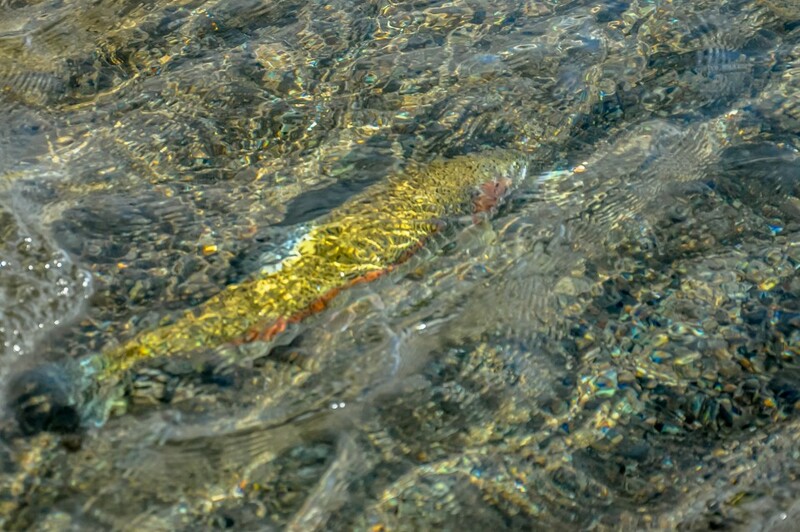 11 Dolly Varden were released and 3 kept for supper fish. Several salmon were landed and many more lost. 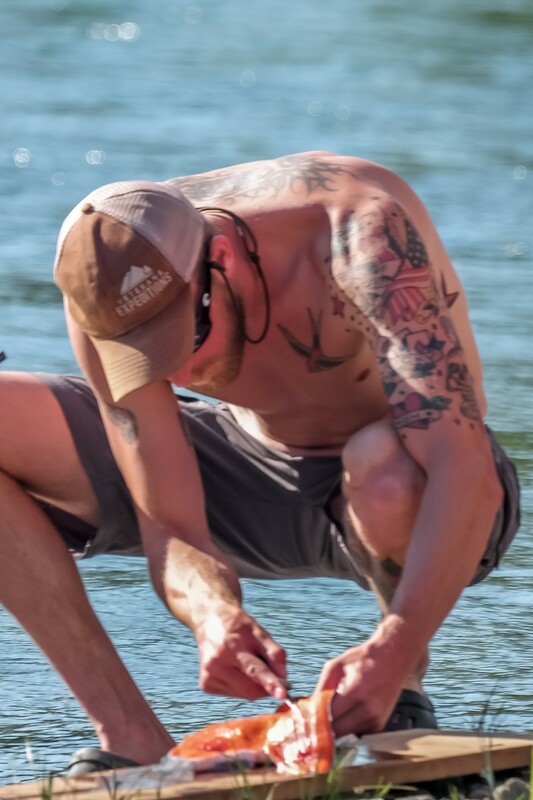 We camped below a high clay bluff full of Bank Swallow nests and watched the adults flying with their young, almost as if they were Air Force training squadrons. The family groups of 3-5 would sally out over the river, across the willow islands, along the back channels, then return back to the home base while chasing and somewhat successfully catching insects on the wing. The young birds looked a lot like student pilots in training. They were attentive but didn’t have all the moves for the type of coordinated aerobatic flight that they will need later on. 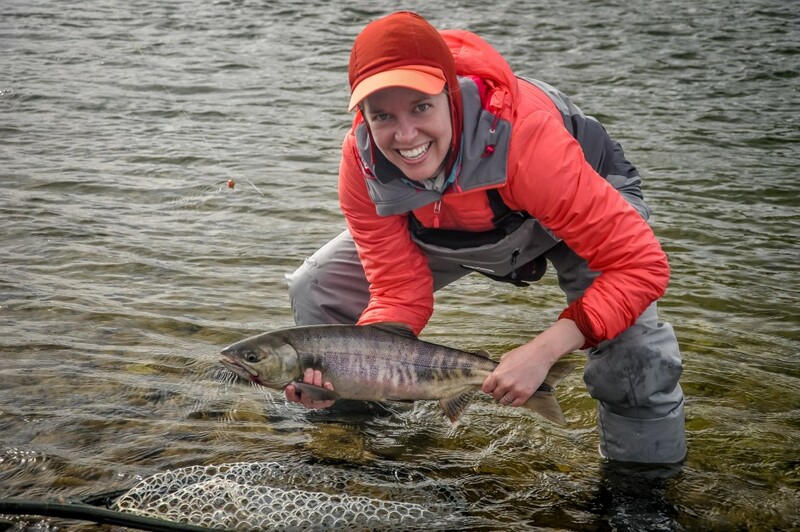 ”Really spectacular numbers of Dolly Varden and Sockeye salmon pushing up past camp.” I fished and rafted with Nick and Kari and the “fishing was hot in the morning until the marine layer burned off and then tapered down to steady numbers”. The fishing was very strong this day and would remain so for the duration of our trip. 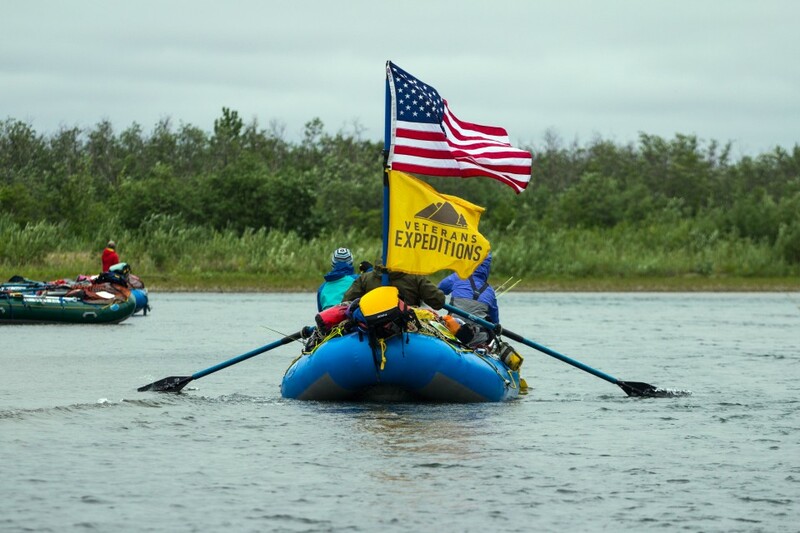 We began what we called “Bar Hopping” which was each raft leapfrogging down to the next gravel bar and pulling over so as to wade and cast to the migrating Char and salmon. 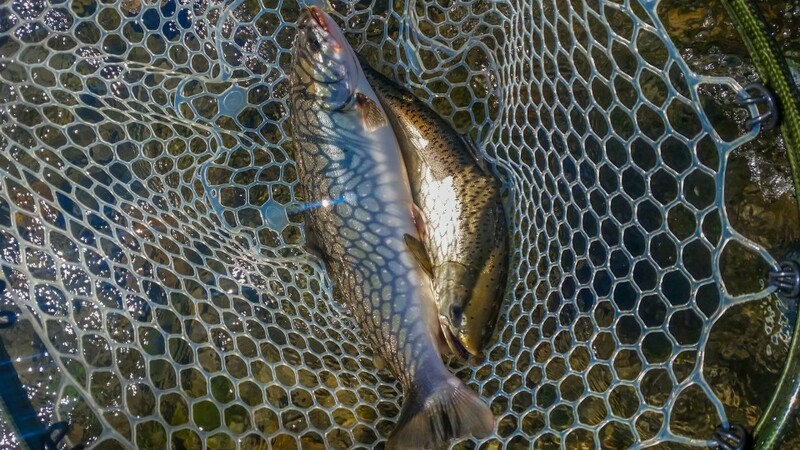 When you’d waded and fished your chosen bar to the end you rafted to the next unoccupied bar down river all the while watching the action of many rods bowed as your pals worked their fish to the net on other gravel banks. The log of July 2’nd recorded 4 Kings netted, 43 Dolly Varden, 21 Rainbows and a handful of Grayling and this was before the Dolly Varden fishing really took off in the lower river and we just won’t share those numbers because it seems like boasting and boasting was not what this crew stood for. Dixie the service dog was a huge hit! She’d make the rounds several times each day giving everyone some affection and then settling in with one of her chosen soldiers to rest at their feet. It is noted for the record that when Mark fractured his ankle on July 2’nd that Dixie knew immediately who her “charge” was and gave comfort and cheer in just the right dosages! What a great group. We got to spend an amazing week of rafting and fishing and enjoying the Wilderness together. 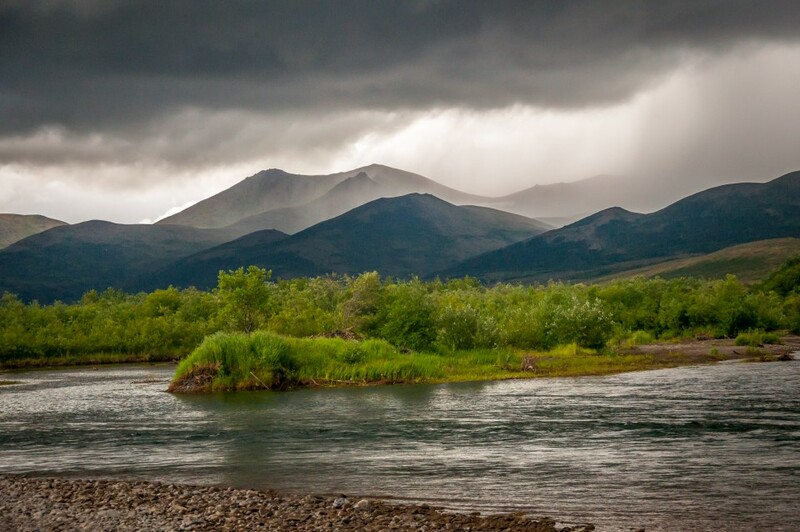 Thanks to the Togiak National Wildlife Refuge, the Kanektok River will continue to provide United States military veterans a great place to experience wilderness rafting, camping, and fly-fishing. 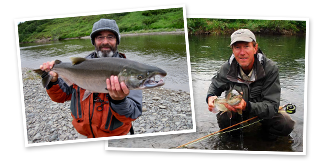 We’d like to thank the following anglers who have fished with Alaska’s Wild River Guides over the years and whose generous contributions made this trip possible. Thank you John Merritt, Jamie Ferry, Michael Curci and Jim Bean. Thanks also to the Louis Family Foundation for their generous support.